When you think about working at PennDOT, you likely picture the construction and maintenance workers that you see so often on the side of the road. Those road warriors are crucial members of the team, but the department has nearly 12,000 employees, many who work behind the scenes to make Pennsylvania's roads and bridges safer for future generations to come. Engineers of all kinds play an important part in the world of transportation. When asked how they got into engineering as a career, many of our engineers said they enjoyed the challenge of solving a problem. As Stephen King, a civil engineer in PennDOT's Harrisburg-based District 8, puts it, engineering is "the scientifically supported artistry of problem solving." He says his curiosity started at a young age. "My parents would buy me building block sets and science kits, then add in the fact that I was interested in shows like 'Bill Nye the Science Guy,'" he explains. "As I continued to grow, I was focused on understanding how things are assembled and how each individual item works together to create something new." Allen Peng, who works in the bridge engineering unit for PennDOT's Pittsburgh-area District 11, offered a similar explanation of his love for engineering: "When I see something I'm always thinking, 'How can I make it better? How can we make it more efficient? What tools do we have to fix the issues?'" 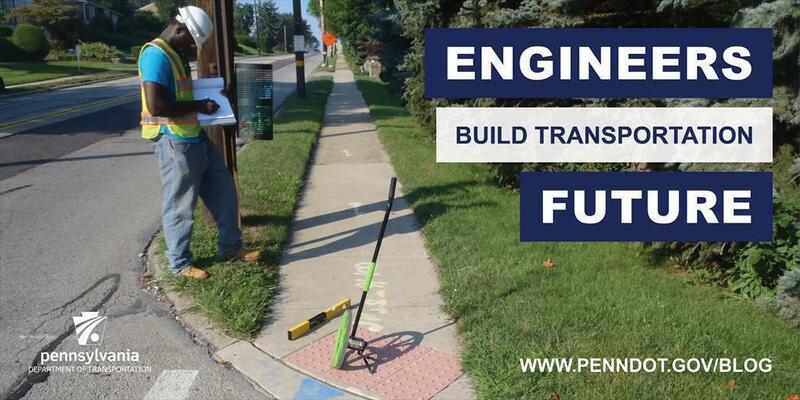 PennDOT engineers solve transportation problems of all kinds - working in construction, maintenance, and design divisions. Paul Manyisha, a project manager in District 11, worked his way through the department, starting as an engineering intern​ (PDF) in in 2010. "It's funny because I didn't know anything about PennDOT outside of the driver's license center, so it was a shock to me that they had an Engineering District," Manyisha said. "A friend of mine was an intern with the department and told me that I should consider applying." He started in the construction unit, where he worked in the labor compliance field and as an inspector on a construction project. The next summer, he returned as an intern in the design unit. "It was nice because I was able to see both sides of the project, from design to completion." In 2012, a week before he graduated from the University of Pittsburgh, Manyisha was hired as a full-time employee. After a year, he was promoted to a civil engineer in the maintenance unit, responsible for designing roadway resurfacing projects. He rotated to the bridge unit in 2015, and then promoted to his current role as a project manager in the project delivery unit in 2017. He currently oversees the design of bridge, roadway, and drainage improvement projects in the district. Similarly, Rodney Hill, a permit design reviewer in Hollisdaysburg-based District 9, has spent his seven years as a PennDOT employee working in the construction, design, and maintenance divisions. He says he gets great satisfaction knowing the work he does as an engineer impacts the everyday lives of Pennsylvanians. Both Hill and Manyisha were also part of PennDOT's inaugural mentoring program, where they were paired with senior individuals and attended various programs that aimed to teach them career skills to help them become future supervisors and leaders within the department. Peng, though still relatively new to the department at just shy of five years, takes part in the other side of mentoring — reaching out to students all the way from grade school to high school. "One of the best parts of my role at PennDOT is being able to participate in volunteering and outreach programs for grade school to high school students," he said. "It's one thing to be doing work that benefits the traveling public, but it's another thing to dedicate our time to inspiring the youth to become passionate about the jobs that we do here at PennDOT." It's that dedication to not only empowering themselves through career development, but instilling a love of STEM-based knowledge in students, that makes PennDOT engineers so great.